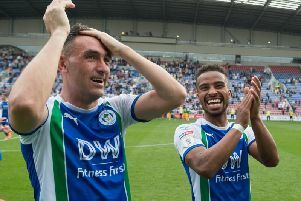 Wigan Athletic are back at the DW Stadium this weekend - and, boy, must boss Paul Cook be happy about that! It’s been almost two weeks since the 1-0 victory over high-flying West Brom. It must seem like two months given what’s happened in the meantime. From the huge feel-good factor generated from deservedly seeing off the Baggies, Latics have come back down to earth. First up was the 2-1 defeat at struggling Millwall, when Latics didn’t deserve anything more for a relatively poor performance. Then came the 4-2 bashing at high-flying Sheffield United, against a side Cook reckons is the best in the division. But both of those games underlined the fine margins (copyright: Malky Mackay) we’re dealing with at the moment. At Millwall, despite the below-par display, Latics were leading 1-0 just before the hour mark when Josh Windass blazed his penalty over the bar and into the River Thames. Within a minute, the Lions had gone up the other end and equalised, before going on to win the game late on. And while the Bramall Lane scoreline looks bad – and it would have been even worse had the Blades not hit the bar in the dying seconds – again there should be an asterix against the result. Latics were much the better side in the opening quarter and, had they made better use of their chances, could have had a stranglehold on the game before the home side found their feet. And while many Latics fans were bemoaning the woeful away record – now the second worst in the division – Blades boss Chris Wilder was admitting the scoreline flattered his side, and some United supporters were claiming Latics were the best side to have visited Bramall Lane this season. So is it glass half-full or half-empty? Latics haven’t been half as bad as their form on the road suggests, with the losses at Aston Villa, QPR and Norwich in particular being tough to stomach. But it’s important, too, to acknowledge the huge gulf between home form and away form, even if it’s just to pacify the supporters who spend so much money in following their side round the country. Hopefully Wigan’s impressive home record – without peer in the Championship – continues this weekend against Leeds. Which only leaves the trip to Middlesbrough to come on Saturday week before another opportunity to take stock during the final international break of the campaign – and maybe chance to get much-needed injured bodies that bit nearer to a return. No, not Halloween, or Bonfire Night, or the start of the festive period...but ‘James McClean day’. When the former Latics star is forced into his annual explanation as to why he won’t be wearing a poppy on his (insert current club) shirt. His incredibly articulate and heartfelt open letter to Dave Whelan four years ago during his time with Latics should have been the end of this ‘debate’. Sadly, somehow, it remains a story. Yes, and if you’d read his reasons why, you’d understand that is never going to change. And why he has every bit as much right to not wear one, as those who criticise him have in sporting theirs. There’s not much I can add to the tributes to Leicester owner Vichai Srivaddhanaprabha, following the tragic events at the weekend. But his role in masterminding THE greatest sporting success story of all time – which will never be eclipsed – has been somehow superseded by his remarkable human qualities, judging by the hole he’s left in the lives of all who knew him. A fairytale story, an incredible legacy, which will live on forever.